How to make every date fun and exciting! /How to make every date fun and exciting! Need more spontaneity, a deeper understanding of your partner and more fun in your relationship? Read on. Because if you’re anything like a normal couple, you’re constantly at a loss for new and interesting date ideas. Anyone loves a dinner and a movie as much as the next person, but unfortunately that combo grows old quite fast. This Easter break we’re giving you a radical idea that will bring the fun and excitement back into your dates. Behold: The Kefalos Date Box. An empty Kefalos yoghurt (1kg) or ice cream box (2l). A bit of courage and humor. On your pieces of paper/sticky notes you will each write down things you really want to do on date night. Write whatever you like, remember to keep it fun and exciting. Neatly fold your ideas so that no one can peak and see what the other has been writing. (If you don’t live together you can trust one partner with keeping the box). On date night, shake the box and randomly pick an idea. The idea of the date box is that you must do – whether it’s watching Ronaldo and Real Madrid vs. Man U, or a romantic dinner with Brad P. or Denzel W. – well, then that’s that. Make sure you write things you’ve always wanted to do. If you also add the reasons why you want to do it, we are sure you will find new levels of understanding for each other. What happens if the loser doesn’t want to play fair? If a partner should refuse to cooperate they will have to declare a forfeit. The forfeit can be whatever the other partner decides. 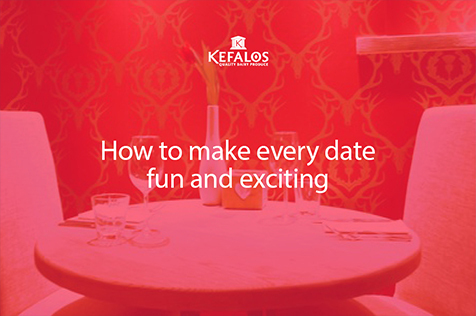 If your partner is not willing to do the forfeit they’ll suffer the “Kefalos Forfeit”, which means they’ll have to prepare any meal of the day using your favourite Kefalos product. (check out the recipes section for a whole range of delicious, easy to prepare meals). Dinner in the dark: Enjoy a meal in total darkness – not only will your senses be focused more on every scent and taste, you will also have shared a unique experience. YouTube karaoke: Put on a show for your partner using lyric videos from YouTube – this one will surely kick you down memory lane together. Relive a moment: Reminisce together and try and relive a special moment in your relationship – your first date or the first time you met or the first time you met each others parents. Volunteer together: Find out what matters to you both and help out at a charity together. Kizomba/Salsa: Learn to dance together – nothing brings you together like shaking it together. Watch a movie outdoor: Zimbabwe has a many places now that do outdoor films. Find the nearest one to you. Sounds like fun? Please send through your photos to our Facebook using the hashtag #kefalosdatebox.